The holidays are quickly approaching which is a time that we tend to overindulge. One way to combat that and to get through the holidays without gaining weight is to substitute a few meals with some healthier options. When I am working hard to make healthier choices, I like to combine seasonal veggies and fruit in tasty juices for breakfast, and often have big salads for lunch chock full of crunchy, colorful vegetables. 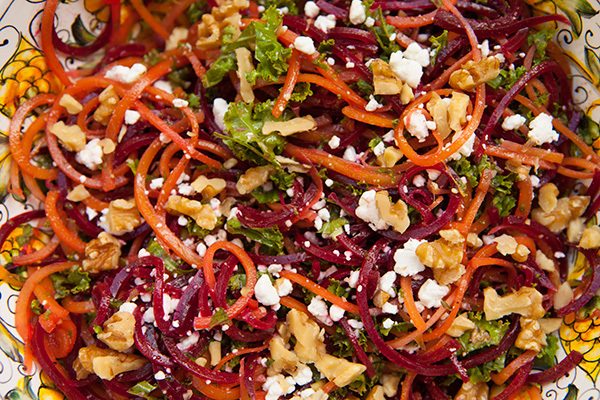 A spiralizer is a kitchen tool that has become very popular this past year, and it is a great way to incorporate different vegetables into your salads. 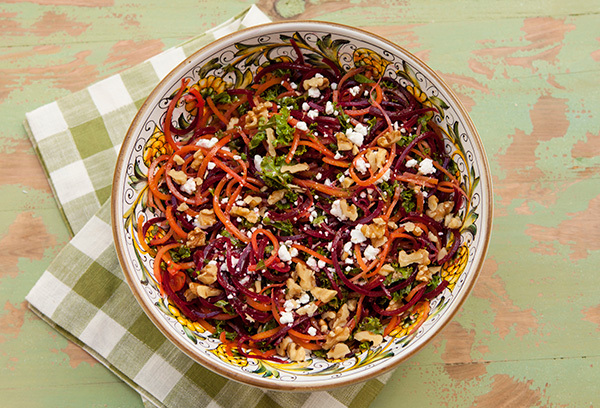 In this colorful salad, I combined beets and butternut squash, threw in some parsley leaves and kale for added nutrition and color, some toasted walnuts for extra crunch, and dressed the salad in a vibrantly flavored lemon vinaigrette. 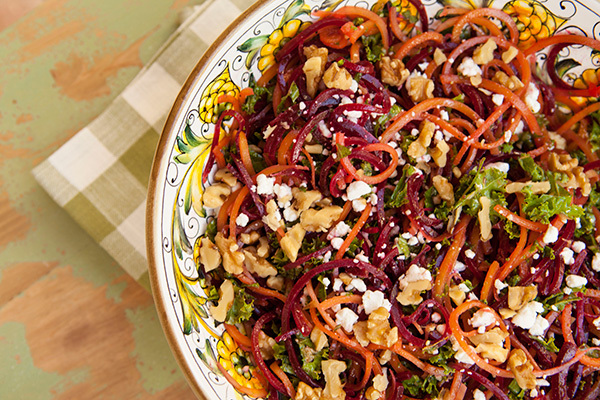 The beets and squash noodles are quickly blanched for this salad and are then dropped into an ice bath to stop the cooking process and to keep the veggies crisp. You could also add any vegetables you have on hand such as carrots or zucchini in place of the beets and squash. To keep the salad vegan, simply skip the addition of the goat cheese. Beets are rich in flavonoids that help counter cell damage reducing the risk of cancer and cardiovascular disease. As well, berries contain important antioxidants that help reduce inflammation. Butternut squash is an excellent source of vitamin A. But that’s not all; there are significant amounts of vitamin C, E, K, B6, folate and thiamin. Spiralize the beets, and cut the neck off of the squash, reserving the bottom section for another use. Peel the neck of the squash, then spirals it as well. Bring a pot of water to a boil, and blanch the squash spirals for 1 minutes, then drop into a bowl of ice water. Blanch the beet spirals in the boiling water for 1 minute, then drop them into the ice water bath as well. Pat the spirals dry, then place in a serving bowl with the kale and parsley leaves. 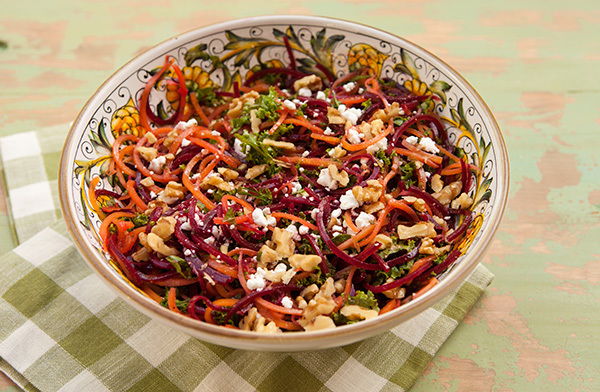 In a small bowl, whisk together the dressing ingredients, then pour them over the veggies. 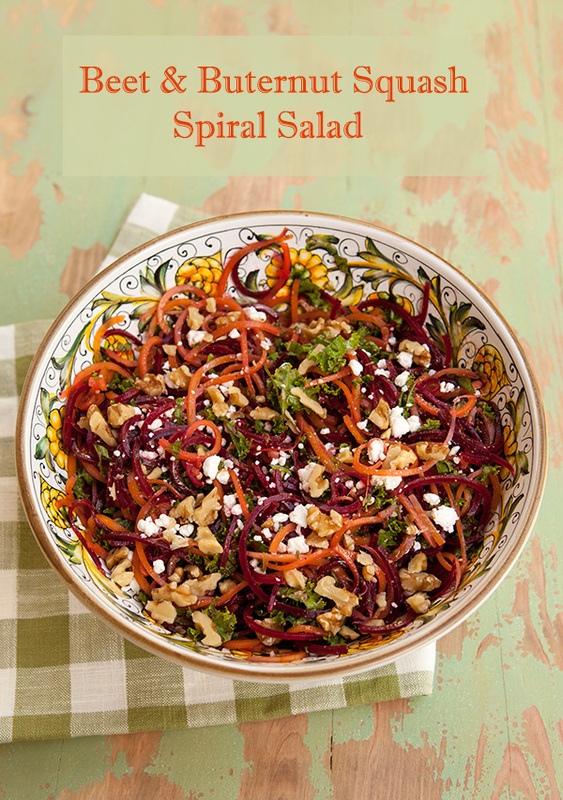 Toss to coat the spirals in the dressing, then add the walnuts and goat cheese crumbles.